The Asus Chromebook Flip was one of our favorite Chromebooks when it launched, and Asus has finally announced its followup at CES 2019. Much like the previous model, the new Asus Chromebook Flip C434 features an all-aluminum build, that's durable and feels premium. But, Asus has doubled down on the design this time around, introducing its NanoEdge display technology to cram a 14-inch Full HD (1,920 x 1,080) display into a 13-inch laptop. That means you're getting a Chromebook with the kind of thin bezels you'd expect on one of the best Ultrabooks. Asus has increased on the power inside, too. This is a high-powered Chromebook with 8th-generation Intel Amber Lake fan-less processors, up to 8GB of RAM and 128GB of storage. With the lightweight nature of Chrome OS, this hardware will let you get some serious work done. The new Asus Chromebook Flip also has plenty of ports, with two USB 3.1 Gen 1 ports for charging and data transfer, along with USB Type-A and microSD. 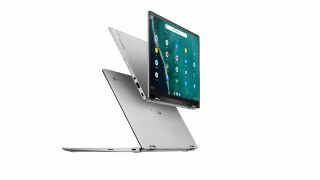 The Asus Chromebook Flip C434 will be launching in the coming months, starting at $569 (about £450, AU$800). If Chrome OS isn't your style, and you're looking for a thin, light and affordable Windows 10 laptop, Asus has also announced a refresh of its VivoBook with 8th-generation Whiskey Lake processors. The new Asus VivoBook 14 and VivoBook 15 are mid-ranged laptops, powered with up to an 8th-generation Intel Core i7 processor, up to 16GB of RAM and a 256GB SSD. This is all behind a 14-or- 15-inch FHD (1,920 x 1,080) NanoEdge display with thin bezels. And, unlike a lot of other laptops in 2018, the new Asus VivoBooks come in a wide range of color options, and even comes with Asus' ErgoLift hinge that lifts the laptop as you open it for a more comfortable typing experience. The touchpad also has a number pad built into it – so you can quickly get some work done without needing a full-sized keyboard. The new Asus VivoBooks will be releasing sometime in Q1 2019, though Asus hasn't shared pricing information at the time of writing.